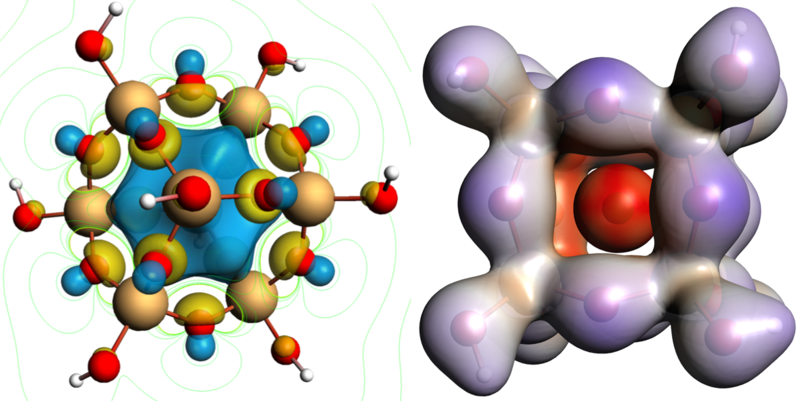 The intriguing bonding interactions of fluoride inside a silicate double 4-ring (D4R) – a common zeolite unit- have been scrutinized with ADF in a recent paper by Goesten, Hoffmann, Bickelhaupt, and Hensen. As now theoretically shown, all halides prefer to occupy the center, thereby minimizing cage deformation (strain). In absence of this strain, the bonding interactions would have been larger at the vertex of the cage, and in fact the central position would have been a transition state (TS) for a diagonal movement across the silica box. By minimizing the deformation strain, the silicate D4R forces F– to take the central position, freezing the TS. In the center, fluoride engages in eight-coordinate hypervalent bonding. The energy decomposition analysis of the bonding components (Pauli repulsion, electrostatic interaction, and orbital stabilization) reveals a correlation between Pauli repulsion, and the size of the centered halide. Cl–, Br– and I– engage in increasingly stronger electrostatic attraction and orbital interaction with the double 4-ring, with respect to F–. But this is outweighed by larger values for Pauli repulsion. As a result, only fluoride possesses a strong net bonding interaction. Other small ions (Li+, OH-, H-) also engage in net bonding with the D4R. Molecular Orbital analysis, using ADF’s integrated fragment analysis, indicate that at the cage center, fluoride is eight-coordinate. The bonding is highly delocalized, and whereas fluoride binds to 8 Si’s, the MO bond order is four. The cage-centered delocalized LUMO and its contour plot across the diagonal of the silica D4R (left) and the difference density, showing charge flowing from the central fluoride to the cage (right). M. G. Goesten, R. Hoffmann, F. M. Bickelhaupt and E. J. M. Hensen, 8-Coordinate Fluoride in a Silicate Double-4-Ring, Proc. Nat. Acad. Sci. 114, online (2017).